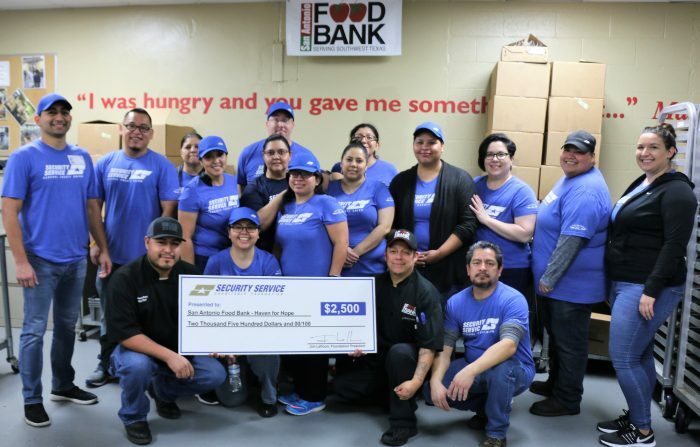 SAN ANTONIO, TX (February 12, 2019) — The Security Service Charitable Foundation has presented $2,500 to the San Antonio Food Bank who has been fighting hunger in Southwest Texas through food distribution programs, education, and advocacy since 1980. Funds will be used to purchase kitchen equipment for the food bank’s community kitchen at Haven for Hope. This kitchen serves 55,000 meals monthly and is open 365 days a year for breakfast, lunch, and dinner. The credit union has been actively involved with the food bank for many years through food campaigns and the Volunteer Corps which serves meals at the Haven for Hope kitchen several times a year. The Security Service Charitable Foundation helps further Security Service Federal Credit Union’s corporate goal of community service by contributing to deserving organizations and causes in the credit union’s market areas. Security Service Federal Credit Union employees present a $2,500 donation to the San Antonio Food Bank’s Community Kitchen at Haven for Hope.